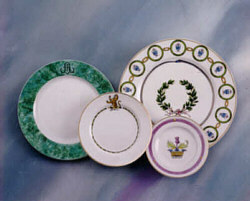 NCM Studio has recently expanded our product line to include custom designed dinnerware for individuals. Enjoy the experience of combining your tastes and wishes with the designer's talents. Achieved will be a set of dishes that will fit you and your home perfectly! This dinnerware will become a family heirloom for generations to come. Contact the Studio to answer any questions you may have at no obligation. When you have dinnerware designed especially for you, additional pieces can be created to coordinate with your new service. 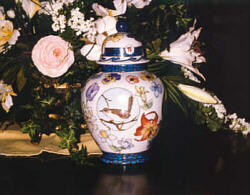 Such items may include: vases, lamps, decorative boxes, bathroom accessories and dresser sets.